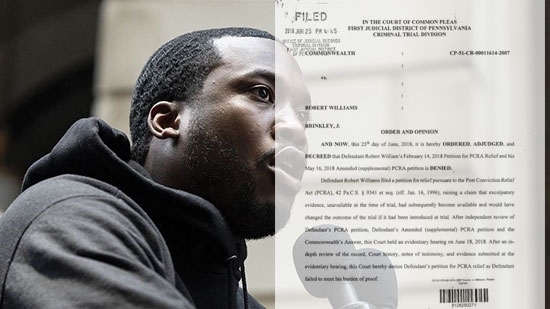 Philadelphia Common Pleas Judge Genece Brinkley has denied Philadelphia rapper Meek Mill's, aka Robert Rimeek Williams, appeal for a new trial. The judge filed her decision on Monday, 6/25, one week from the appeal hearing on 6/18. Mill had appealed his 2008 conviction on drug and gun charges under the Post Conviction Relief Act claiming exculpatory evidence has become available. The defense pointed to the credibility of one of Mill's original arresting officers who also testified at trial. The former Philadelphia police officer's integrity has been called into question. The Philadelphia District Attorney's office also supported a new trial. Judge Brinkley, who has handled the case since the beginning, found that the defendant “failed to meet his burden of proof.” Defense lawyers plan to appeal Brinkley's decision to a higher court. Read Meek Mill's entire trial docket. The suspect wanted in the abduction of a 2-year-old boy in the city's Frankford section turned himself into police on Tuesday, 6/26. 24-year-old Jared Montgomery faces charges of kidnapping and endangering the welfare of a child. It started at 9:40 p.m. Monday, 6/25, on the 4900 block of Frankford Avenue. The boy and his mother were standing at the bus stop when her ex-boyfriend (Montgomery) approached. The two got into an argument which ended when Montgomery grabbed the child and ran off. He dropped the child off unharmed at Frankford Hospital at 6:30 a.m.Tuesday and fled before turning himself in this afternoon. The Ocean County Prosecutor's Office announced a new charge against a high school student who threatened to shoot up his graduation. 19-year-old Matthew Vanderbeek of Cream Ridge will additionally be charged with 1st degree terrorism. That charges carries a 30-year sentence. He was previously charged with terroristic threats with a threat to kill and second-degree attempting to possess a firearm for an unlawful purpose. Vanderbeek had used social media to threaten to shoot up the high school graduation ceremony at New Egypt High School. A search warrant exercised at his home confirmed he made those threats and also found that he was attempting to obtain a firearm. He is currently being held at Ocean County Jail.